Lubie® 200 is a blended formulation of synthetic lubricants in a fast evaporating solvent carrier. Lubie® 200 is formulated to reduce friction, decrease heat and prevent wood resin build up on moulder beds, planer beds and other wood transfer equipment. Lubie® 200 dries very quickly, leaving a durable lubricating film on the bed. Wood staining, painting, laminating and other finishing operations generally are not affected because there is no silicone, grease or wax used in the formulation. Lubie® 200 is designed for use in automatic, semi-automatic and manual bed injector systems. The very low viscosity allows it to also be used in spray bottles. 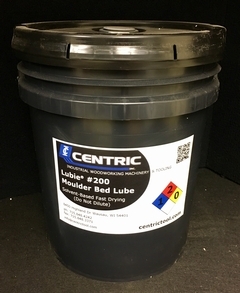 Centic Inc. offers Lubie® 200 in a 5gal pail or a 55gal drum.